Our Mobile Rock Climbing Wall is the biggest and first in Victoria and is a unique experience for the whole family. 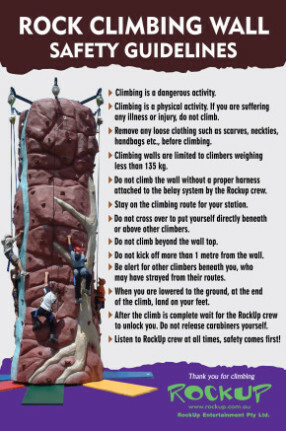 Climbing walls are a creative and innovative attraction, they are an ideal learning tool that is both challenging and fun and a stand out attraction at any event. Getting to the top and ringing the bell lets everyone know you made it. When you want to come down, just sit back and let the descender lower you. Adults and children enjoy a controlled and safe environment. Climbers of all ages can enjoy the experience. Everyone will want to climb again and again. – Takes up to five climbers at one time. – Has five different climbing patterns. – Has almost 60 square metres of climbing surface. – Is 8 metres high. Special Requirements Must be on flat surface with oversize trailer access. Trailer is 2.5m wide and 10m long.